The urogenital system is the organ system of the reproductive organs and the urinary system. These are grouped together because of their proximity to each other, their common embryological origin and the use of common pathways, like the male urethra. Today, I’ll be taking a look at human primary cells derived from urogenital organs (and in one of my next posts, we’ll explore models for the digestive system. The proximal tubule is the portion of the duct system of the nephron of the kidney which leads from Bowman’s capsule to the loop of Henle. It has a single epithelial cell layer. The luminal surface of the epithelial cells of the proximal tubule is covered with millions of microvilli that form a brush border and increase surface area. Human Renal Proximal Tubular Epithelial Cells (HRPTEpC) have a pivotal role in kidney function including reabsorbtion of glucose and protein, and also play a part in the glucotoxicity associated with diabetes. HRPTEpCs provide a useful tool for studying various aspects of pathology and biology of the human renal proximal tubular cells in vitro. HRPTEpC from Cell Applications, Inc. have recently been used in a study of metabolic enzymes responding to energy depletion in renal cells (Jackson, 2014). Purity of each lot is verified using morphology and CD13 flow cytometry – ZenBio RPCTs are qualified at >80% CD13+ upon QC release. Renal proximal convoluted tubule epithelial cells (RPCTs) are an essential research tool for understanding a variety of biological processes in the kidneys. They can also be utilized to determine renal toxicity of compounds as well as to study underlying causes and fundamental aspects of human kidney diseases. These primary RPCTs are collected from unfractionated kidney cell preparations from normal, non-diseased human kidney tissues. The bladder epithelium forms an effective multifactorial barrier to urine, toxic metabolites, and pathogens. Additionally, the presence of aquaporins (AQPs), urea transporters, and ion channels indicates that the bladder epithelium has all the machinery necessary to actively alter the composition of the urine. Therefore, this tissue may play an unappreciated but important role in water, salt, and solute homeostasis. One of the most exciting functions of the bladder epithelium is its potential role as a sensory transducer. By receiving, amplifying, and transmitting information, the bladder epithelium can convey information about the mucosa and urinary space to the nervous and muscular systems and help coordinate bladder function during filling and voiding. Human bladder epithelial cells (HBlEpC) can be used as a powerful tool in studying bladder epithelial development and function, mechanisms of cancerogenesis, especially those related to urothelial carcinoma of the bladder, as well as the processes by which epithelial cells achieve and maintain their specialized plasma membrane domains, and how these functions are disrupted in disease. HBlEpC from Cell Applications, Inc. have been used as a normal control in a study measuring expression of CD44v6, a potential novel biomarker for bladder cancer (Hattori, 2014). The outer smooth muscle layer is dissected away from the inner urothelial cell layer of the bladder prior to explant culturing to isolate the smooth muscle cells. Smooth muscle cells are found in lymphatic vessels, the walls of blood vessels, the bladder, the uterus, and other areas of the body. The primary function of smooth muscles is to create contractions in the presence of an external stimulus. This stimuli can differ in different areas of the body to generate individual effects. ATP hydrolysis provides energy for smooth muscle contractions. They are created by a sliding motion between actin filaments and myosin. These cells express the smooth muscle cell markers smooth muscle alpha-actin and calponin, and are functional as demonstrated by a cell contraction assay. Each lot of Zen-Bio’s Human Bladder Smooth Muscle Cells is tested by flow cytometry for the smooth muscle markers Calponin and smooth muscle alpha-actin. Top: Human Cervical Epithelial Cells, HCvEpC. Bottom Left: HCvEpC immunolabeled with an anti-CK18 C-terminal antibody. 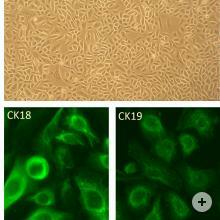 Bottom Right: HCvEpC immunolabeled with an anti-CK19 antibody. The cervix consists of ectocervix and the endocervix and contains two types of cells, columnar and squamous epithelial cells. Columnar epithelial cells form a single layer of mucous-secreting cells located in the endocervix and a variable portion of the ectocervix while squamous epithelial cells are located on the ectocervix. The transformation zone is the region on the ectocervix where over time the more fragile columnar epithelial cells are replaced with more durable squamous epithelial cells. This area is particularly vulnerable to pre-cancerous changes (dysplasia) due to the high turnover rate and low maturation level of the cells. The primary cause of cervical infection or disease is acquisition of a sexually transmitted infection (STI), especially with the human papillomavirus (HPV), and a growing body of research suggests that the cervix is the primary site of HIV infection for women. Human Cervical Epithelial Cells (HCvEpCs) should provide a useful tool for studying various aspects of pathology and biology of the human cervical epithelium in vitro, particularly those related to HPV infection and tumorigenic mechanisms. To meet various needs for research and development, Cell Applications, Inc. have isolated and purified Human Cervical Epithelial Cells (HCvEpCs) from ectocervix of normal human cervix to create more realistic in vitro models. 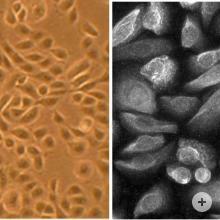 Human Prostate Epithelial Cells, HPrEpC (left). HPrEpC immunolabeled for cytokeratin 18 (right). HPrEpC and Human Mammary Epithelial Cells (HMEpC), both from Cell Applications, Inc., have been used in a study demonstrating that TGF-b1 induces Smad 1/5/8 and Smad 2/3 phosphorylation and BMP signaling results only in Smad 1/5/8 phosphorylation in these primary epithelial cells, while in cancer cells BMP also elicits Smad2/3 activation, contributing to cancerogenesis (Holtzhausen, 2013). Top Left:Human Urethra Epithelial Cells, HUEpC. Top Right: HUEpC immunolabeled with an anti-CK19 antibody. Bottom Left/Right: HUEpC transfected with GFP plasmid DNA using the Cytofect™ Epithelial Cell Transfection Kit. In addition to functioning as physical barriers against microbes, the urethral epithelial lining participates in the first line of host defense by producing a variety of proinflammatory mediators when exposed to microbes and microbial agents. 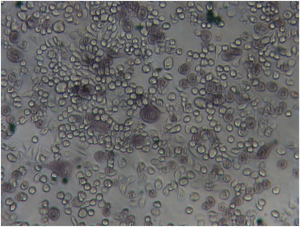 To meet various needs for research and development in human urethral epithelial cells, Cell Applications, Inc. has isolated and purified Human Urethra Epithelial Cells (HUEpC) to create a more realistic in vitro model. Cell Applications, Inc. HUEpC are isolated from prostatic urethra and provide a good system for studies of urethral epithelial cells under normal and pathological conditions.